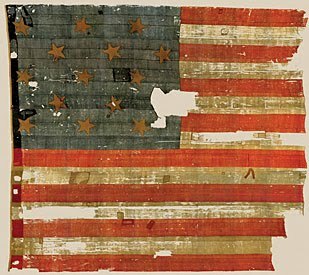 Some say the lyrics of the Star Spangled banner are out-dated – we need a new Anthem, they say, but the words are still as wonderfully expressive to me, as they surely were then to those who loved this country enough to risk all they had. Perhaps we sing the song without thinking about the meaning behind the words. Think about it. 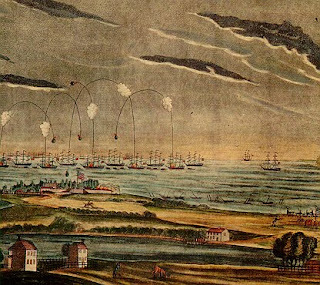 Francis Scott Key looked for the flag from an anchored ship, in the breaking dawn of the battle for Fort McHenry. …let’s go back to the summer of 1813…At…Fort MHenry, the commander, Maj. George Armistead, asked for a flag so big that “the British would have no trouble seeing it from a distance.” Two officers, a Commodore and a General, were sent to the Baltimore home of Mary Young Pickersgill, a “maker of colours,” and commissioned the flag. Mary and her thirteen year old daughter Caroline, working in an upstairs front bedroom, used 400 yeards of best quality woold bunting. They cut 15 stars that measured two feet from point to point. Eight red and seven white stripes, each two feet wide, were cut. Laying out the material on the malthouse floor of Claggett’s Brewery, a neighborhood establishment, the flag was sewn together….It measured 30 by 42 feet and cost $405.90. In the video below, a beautiful, and unknown voice to me (maybe Jordin Sparks) sings The Star Spangled banner. 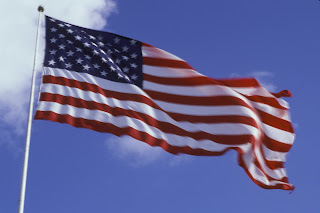 The lyrics are on the screen, and if you haven’t done it recently, take a moment on Flag Day to sing along and think about the men in battle, the families under seige, the enemy on our shores, and celebrate our star-spangled banner. Today, still protecting the star-spangled, is the U.S. Army, celebrating a 235th Birthday on June 14th. The Conservative Lady feeling patriotic. See a rousing video of Gene Simmons leading the trips of the anthems of each branch of our military. What a great video! GeeeeeZ! – What’s the FLAG mean to you? Amusing Bunni who on Flag Day, gives us a gift. She has a video of college kids, who probably voted for Obama…have seen the light, have accepted it, and now send him a message. It will make you smile. Odie at Woodsterman has a big, waving flag, not as big as Gen. Armistead’s 42′ flag, yet a big, spirited and waving Old Glory.